This company is known for making high-end speakers to make the life of corporate users easy. However, it does not mean that domestic users cannot take advantage of the products. There are speakers made for the concert as well as the ones which can be easily attached to LEDs to make sure that sound increases. The company also makes sure that key recommendations are given to users before they look at the wide range of speakers available. The Clear and clean sound is the slogan of this company which they act upon very seriously. It is the only company on this list that has won several awards over the years for quality and reliable manufacturing. The various brands and types of speakers being developed clearly show that the organization is very serious to take a huge market chunk. 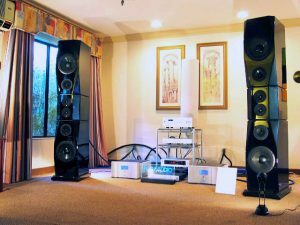 Tweeter and woofer are the main technology this company focuses on. Established in 1993 the company aims to make speakers which are reliable as well as affordable. It is also one of the few companies which are 100% Canadian. The parts as well as assembling are all done in the country to avoid high costs. Made for music is what this company calls its products. There are several other manufacturers which work under the umbrella and therefore best models are created here. There is a huge manufacturing range of the speakers which are manufactured by this company. It clearly shows that the company wants to capture every market class and section. From Master to Prestige series there are many models which are known for their reliability. High-end users include Richard King and McGill University which shows the quality. Accurate sound production and reproduction are what the equipment of this company is known for. The company claims that it is the only one manufacturing high-end equipment of same quality for both corporate and domestic users. The company manufactures all parts of the equipment in Canada which makes the end products very cheap and reliable. The user reviews about the product are highly positive which shows that this company delivers. Many high-end music related magazines have also published about the company. Such reports also show that the burgeoning musical environment in Canada has seen as the new face in form of Studio lab. The company also heavily focuses on after sales services and parts maintenance.